eDepartment of Radiology, (A.G.S. ), Athinoula A. Martinos Center for Biomedical Imaging, Massachusetts General Hospital and Harvard Medical School, Charlestown, Massachusetts. 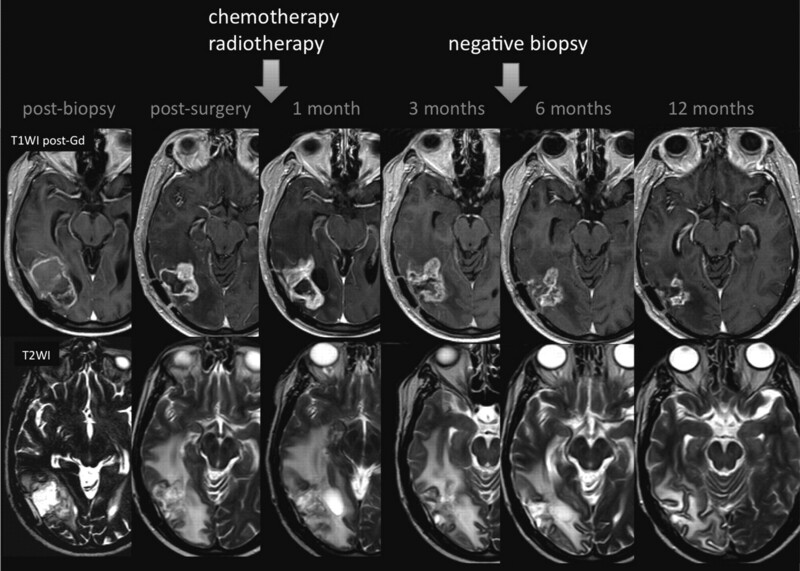 The current standard of care for newly diagnosed cases of high-grade glioma is surgical resection followed by RT with concurrent chemotherapy. The most widely used criteria for assessing treatment response are based on a 2D measurement of the enhancing area on MR imaging known as the Macdonald Criteria. Recently, nontumoral increases (pseudoprogression) and decreases (pseudoresponse) in enhancement have been found, and these can confuse outcome evaluation. Here we review pseudoprogression and pseudoresponse and describe how better understanding of these phenomena can aid interpretation. GBM is the most common primary malignant type of brain neoplasm in adults and is associated with a dismal prognosis. The current standard of care is surgical resection followed by RT and concomitant and adjuvant TMZ chemotherapy. This is a relatively recent standard, with pivotal data published in 2005, and it represents a milestone, because this approach has been shown to prolong the overall survival of these patients.1 With the standardization of treatment around surgery/RT/TMZ, certain patterns are beginning to emerge that were not previously noticed. In addition, in May 2009, the US Food and Drug Administration approved bevacizumab for recurrent glioblastoma. This anti-VEGF agent also can have a marked pattern of change on MR imaging. In addition to impacting individual patient care, these changes have also had an impact on clinical trials of new therapies. The Macdonald Criteria2 are currently the most widely used guideline for assessing response to therapy in patients with high-grade gliomas. These are based on 2D tumor measurements made in MR imaging scans, in conjunction with clinical assessment and corticosteroid dose. According to the Macdonald Criteria, tumor progression is considered to have occurred when an increase of >25% in the size of the contrast-enhancing lesion is observed. There are important limitations to these criteria, which only address the contrast-enhancing component of the tumor, and various updated guidelines for RANO have been published.3,4 As radiologists learn early in their training, contrast enhancement in posttreatment brain tumors is nonspecific and may not always be considered a true surrogate of tumor response. The limitations of the Macdonald Criteria have become acutely apparent with the use of novel treatments. Both pseudoprogression, an increase in the nontumoral enhancing area, and pseudoresponse, a decrease in the enhancing area, show that enhancement by itself is not a measure of tumor activity but rather reflects a disturbed BBB.5 Most new RANO criteria, therefore, suggest that the nonenhancing component of the tumor also be taken into account when making assessments about progression or response. Three different types of effects of brain RT can be identified on the basis of the time of occurrence and clinical presentation: acute (during radiation), subacute or early-delayed (up to 12 weeks after radiation ends), and late (months to years postradiation). Both the acute and subacute types of radiation-induced injury are thought to be caused by vasodilation, disruption of the BBB, and edema. 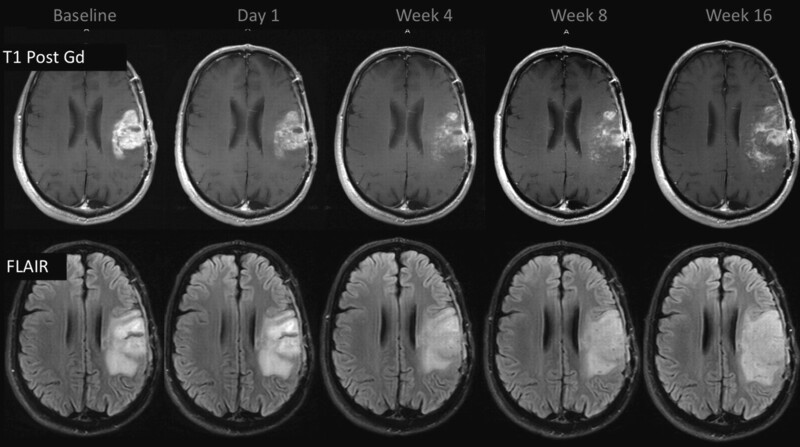 Although diffuse brain swelling has been described, the MR imaging data in the early period after RT usually appear relatively unchanged.9 When the subacute type of injury is visible, MR imaging findings can vary from edema to new lesions or increased size of contrast-enhancing lesions within the immediate vicinity of the irradiated tumor volume.6 Late delayed reactions, occurring from within a few months to many years, may be due to necrosis triggered by ischemia secondary to blood vessel damage and may depend on increased capillary permeability, leading to fluid transudation and consequent brain edema. More complete study of the time course of these changes and their appearance is urgently needed. Currently, the only method of distinguishing pseudoprogression and early progression of disease is to perform follow-up examinations of the patients because conventional MR imaging is unable to differentiate the 2 and alternative techniques have not yet been validated in prospective trials.9,11 Analysis with follow-up conventional MR imaging examinations allows such a distinction because the changes related to pseudoprogression decrease in size. The development and validation of new methods to evaluate true brain tumor response—as opposed to inflammatory change—would be very helpful in the assessment of treatment efficacy. The higher rates of methylated MGMT promoter found in patients with pseudoprogression may be correlated with the efficacy of concurrent radiochemotherapy on residual tumor burden. MGMT methylation status may prove to be an important clinical factor in the evaluation of imaging-based changes early in the post-RT phase of treatment. Thus, we can speculate that methylated MGMT may be a good indicator of therapeutic response and a better prognosis, given that an increased overall survival has been observed in these patients. Pseudoprogression. A 63-year-old man with GBM. A follow-up MR imaging examination performed 7 months after RT-TMZ demonstrates increased lesion size. The histopathology samples (not shown) demonstrated a mixed tissue with treatment-related changes, associated with a few areas of viable tumor cells. Pseudoprogression may influence the clinical recommendation to continue with adjuvant chemotherapy rather than the change to a second-line therapy for recurrence.16 The diagnosis of pseudoprogression should depend on follow-up scans until an improved method is established. The terminology of pseudoprogression in some ways overlaps the classic definition of radiation necrosis, which also consists of marked enhancement in the tumor bed but without actual tumor; it is not incorrect to say that pseudoprogression represents a mild and self-limiting variant of treatment-related necrosis.5 This overlap in terminology is somewhat unavoidable, so care should be taken to focus more on the findings and, given the imprecision of the methods in common use, to avoid specific pronouncements regarding tumor-versus-radiation effect. At some time points, the distinction might be easier—for example, if an increased enhancement at the first post-RT MR imaging is observed, this is some sort of radiation effect and most likely will subside. However, early rapid progression cannot be ruled out and is merely the less probable diagnosis, not something that imaging findings can confidently establish. Radiation necrosis typically occurs 18–24 months post-treatment and has repeatedly been shown to be difficult to distinguish from recurrence. However, pseudoprogression is observed only in the first few months after treatment, much earlier than radiation necrosis. Some authors have suggested that the concept of therapy-induced necrosis and its radiologic manifestations of pseudoprogression should replace the outdated term “early radionecrosis”; we concur.20 Conventional MR imaging studies at follow-up examination may reveal increased contrast enhancement and peritumoral edema following treatment. 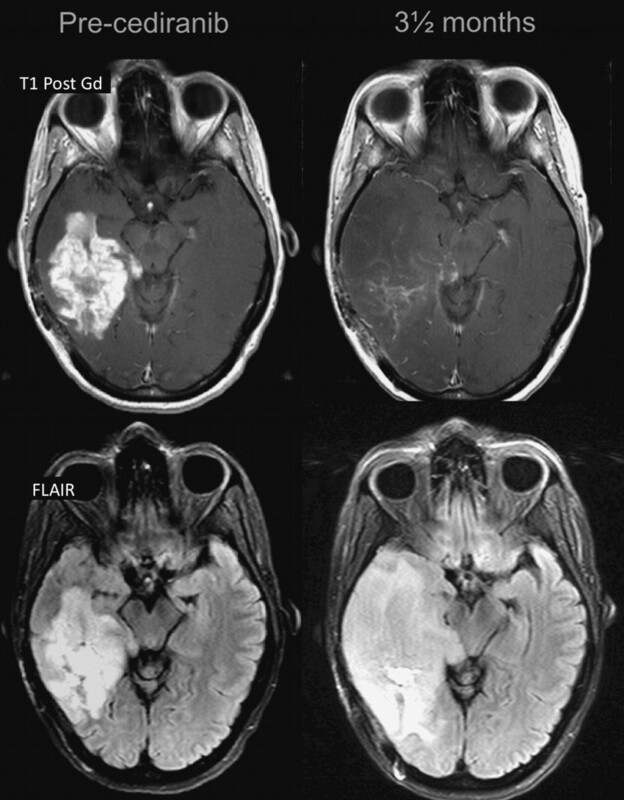 Follow-up MR imaging in the assessment of the evolution of these lesions is useful for depicting pseudoprogression because the contrast enhancement portion of the lesion remains stable or diminishes with time.16 In some cases, true tumor progression is observed. As mentioned previously, to date, no single imaging technique has been validated to recognize and adequately establish a diagnosis of pseudoprogression.14 Although the Macdonald Criteria have been widely used, false interpretations of tumor size increases on post–gadolinium-enhanced T1-weighted imaging may occur. New MR imaging and/or PET tools are needed to characterize tumors before initiation of therapy, depict the changes that result from treatment, and be validated as biomarkers of treatment effectiveness.15 We will briefly review some of these potential new methods. DWI has been assessed to differentiate tumor progression and/or residual tumor from necrosis. ADC values were noted to be higher in necrotic tissue than in recurrent tumor tissue. 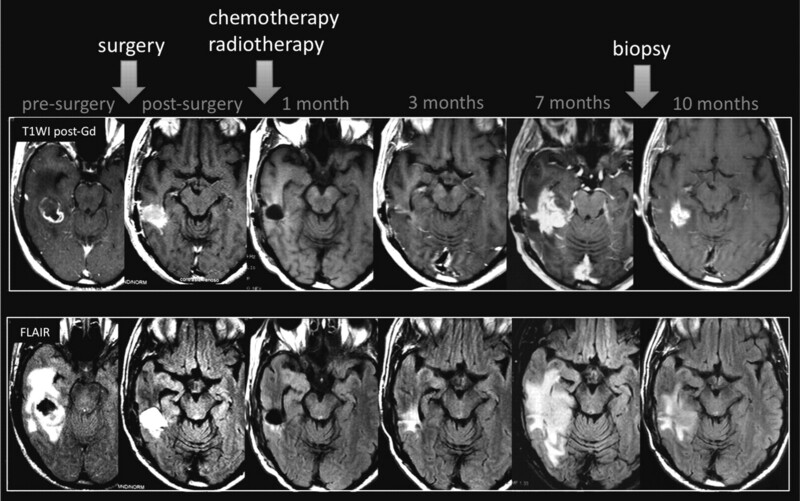 However, available evidence for this imaging technique is limited due to the heterogeneity of tumor content, and differences in groups of patients do not imply high diagnostic performance.11 Other investigators using DTI have demonstrated a higher fractional anisotropy and decreased ADC values in the normal-appearing white matter adjacent to the edema in patients with radiation injury compared with patients with recurrent tumors.24 In short, neither DWI nor DTI provides sufficient information for differential diagnosis between pseudoprogression and true tumor progression. Both imaging modalities generally present heterogeneous signal intensities on DWI and ADC maps, with areas of reduced diffusion that can represent highly cellular tumor areas and/or inflammatory processes. MR spectroscopy can depict structural degradation in cerebral tissue after RT before the development of symptoms or evidence of changes can be observed by conventional MR imaging. MR spectroscopy can reveal significant alteration in brain metabolites such as a slight decrease of NAA and variable changes in Cho. An extensive metabolic peak of lipids/lactate has been demonstrated in radiation-injured brain tissue as well.25 Notwithstanding, in most settings, the differential diagnosis between pseudoprogression and true disease progression based on MR spectroscopy findings is highly challenging. Both types of lesions can present with neuronal loss/dysfunction (low NAA), abnormal cellular membrane attenuation/integrity (high Cho), and anaerobic metabolism (high lactate/lipids). Permeability DSC is also a potential new tool for differential diagnosis between pseudoprogression and true tumor progression. Although no prospective study has examined this hypothesis, preliminary results with this new technique seem very promising, and a number of clinical trials are underway to better delineate the performance of all of the above techniques. FDG-PET can demonstrate differences in the analysis of areas of radiation injury and residual/recurrent brain tumors. However, the reported sensitivity and specificity are low or disputed in some studies.26,27 These limitations can be explained by the high glucose use in the brain, which results in high background activity,9 and by the fact that inflammatory processes can demonstrate high glucose metabolism on PET examinations. To our knowledge, no published data regarding the use of FDG-PET in the assessment of pseudoprogression are available (Fig 3). Pseudoprogression. A 25-year-old man with a low-grade glioma in the left aspect of the pons (A, arrow) was treated with only RT. PET-MR imaging (B) showed hypermetabolism in the enhancing portion of the lesion (C). An MR imaging examination performed 1 month later (D) shows a reduction in the enhancing portion of lesion. Transient increases in contrast enhancement just after completion of chemoradiotherapy play an important role in the clinical management of patients with cancer because they complicate the ability of the physician to determine whether to continue with standard adjuvant chemotherapy or to switch to a second-line therapy for recurrence. Thus, the detection of pseudoprogression versus true progression is a critically important issue in oncology practice. Pseudoresponse is characterized by a marked decreased in the enhancing portion of the lesion some months after initiation of treatment. However, in some such cases, the FLAIR sequence shows a clear expansion of the lesion. The early decrease in contrast enhancement suggests a change in vascular permeability, with a “normalization” of the BBB, rather than a true tumor reduction, as being the underlying cause of the improvement. The rapid change can occur within hours of beginning therapy. Apparent responses to antiangiogenic therapy may be partly a result of normalization of abnormally permeable tumor vessels.34 Thus, the radiologic response should be interpreted with caution because a very brief response—perhaps lasting just a few days or weeks and therefore termed “pseudoresponse”—may be responsible for the imaging and clinical response (Fig 5). Very rapid results were also demonstrated with cediranib, which produced a normalization of the BBB as shown on MR imaging within 24 hours.35 Reversibility of this vascular normalization, with rebound enhancement and edema, was noted when patients required a “drug holiday,” mostly due to toxicity, with a “re-response” after restart.23 On the other hand, the degree of decreased enhancement to these anti-VEGF therapies after just 1 day of treatment correlated well with survival.35 This suggests that pseudoresponse may well be associated with a clinical benefit, just as pseudoprogression is also associated with clinical benefit. Pseudoresponse. A 47-year-old man with GBM. A reduction of the enhancing portion of the lesion is observed 1 day after initiation of cediranib treatment. Four weeks later, besides a continuing reduction in the enhancing portion, an expansion is observed in the FLAIR images. Expansions in both the enhancing area and abnormal hyperintense areas consistent with tumor progression were observed subsequently. Pseudoprogression and pseudoresponse are abnormalities that have been described following high-grade tumor treatment, and remarkably both appear to be associated with future favorable patient outcome. Both phenomena appear to be best diagnosed through follow-up scans because no established method of imaging is yet capable of yielding a definitive diagnosis of true tumor versus enhancement changes due to other reasons. DSC and other methods appear promising but require further testing in the multicenter setting. The authors thank Tracy Batchelor and Elizabeth Gerstner for their help in editing the manuscript.